So I got a cool request from awesome young woman wanting a tattoo, she sent me a text with her son in a jester costume. 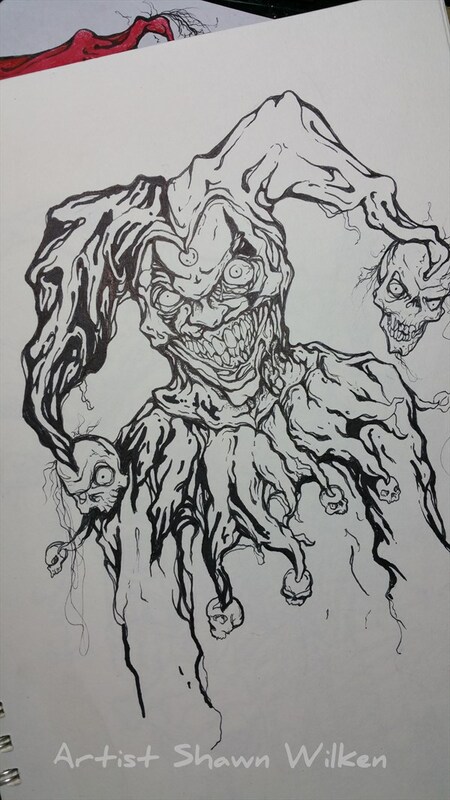 she wanted a jester with some sort of zombie thing for her son. Awesomeness, right up my alley. so I looked up zombie and jester just for fun and this is what I found. I think the dink sounds like a plan. lol. A jester, court jester, or fool was historically an entertainer during the medieval and Renaissance eras who was a member of the household of a nobleman employed to entertain him and his guests. A jester was also an itinerant performer who entertained common folk at fairs and markets. I made a video of drawing, just for fun, so go hit the link to see the video and photos I think it turned out awesome. You do crazy work Shawn! !